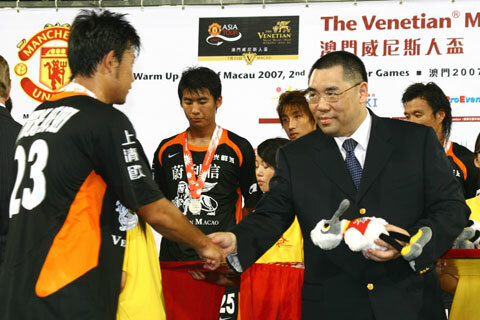 Amid cheers and applause of 16,000 spectators in the Macao Stadium, the Warm Up Event of Macau 2007, 2nd Asian Indoor Games - Venetian Macao Cup featuring Manchester United and Shenzhen Xiangxue Eisiti concluded with the Red Devils winning with a brilliant 6 : 0. 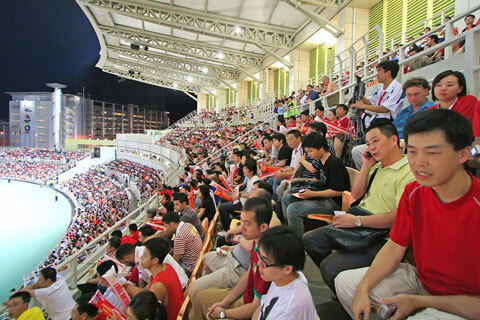 Manuel Silvério, Chairman of the Organising committee for “The Venetian Macao Cup – warm up event of the Macau 2007, 2nd Asian Indoor Games,” remarked that the match was different from large scale football matches ever hosted by Macau. “As the major promotional event of the upcoming Macau 2nd Asian Indoor Games, the match was co-organized by MAIGOC and Kaki Sports Development Company with the support of the title sponsor. The cooperation among the parties was fruitful and effective in cutting organizing costs, enhancing the organizing abilities of Macau. It is also effective in promoting our title sponsor ‘The Venetian Macao Resort’.” Manuel Silvério further extended his gratitude for the dedicated support of ‘The Venetian Macao Resort’ in the organizing of the match, and support to local sporting business. 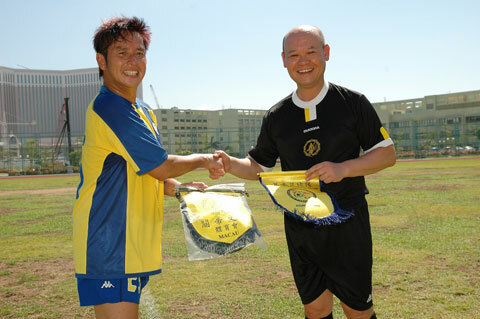 The match kicked off after the greeting session between the teams and officiating guests namely Secretary for Social Affairs and Culture of the Macao Special Administrative Region Dr. Chui Sai On, Chairman of the Organising Committee for “The Venetian Macao Cup – warm up event of the Macau 2007, 2nd Asian Indoor Games,” Mr. Manuel Silvério, President and Chief Operating Officer of Las Vegas Sands Corporation Mr. William Weidner, Chief Executive of Manchester United Football Club Mr. David Gill, Chairman of Shenzhen Xiangxue Eisiti Football Club Mr. Yang Saixin, Director of Manchester United Football Club Sir Robert “Bobby” Charlton, and President of Kaki Sport Development Co. Ltd Mr. Yung Tsz Shuen. The first half of the match ended with The Red Devils leading 3:0. The momentum stayed with Manchester United the entire match with a dominating final score of 6:0. After the match, Mr. Manuel Silvério and President of Xiangxue Zhiyao Company Ltd. Mr. Wang Yonghui presented the award to Ryan Giggs, who was voted by the media the ‘Man of the Match.’ Chairman of Executive Board of the Macau Football Association Mr. Chong Coc Veng presented souvenirs to the referees. Dr. Chui Sai On and Mr. William Weidner presented the gold cup and the silver cup as well as the medals to the Manchester United and Shenzhen teams respectively. Each player of the teams received a plushy doll of the Mei Mei, mascot of the 2nd Asian Indoor Games from Dr. Chui. The Manchester United held the trophy aloft for their fans. Fascinated by the match, fans were enthusiastic and unwilling leave the stadium long after the match. 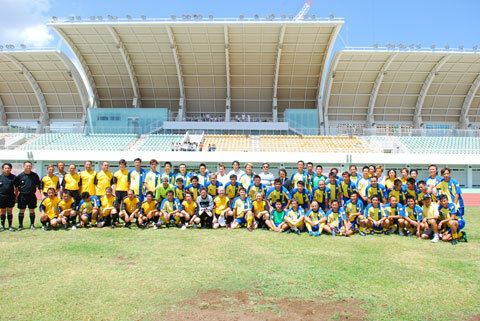 According to the match organizer, over 300 media from 118 institutions were attracted to cover the match. The match was televised by 20 stations, covering in regions including Asia, Europe, Middle East, Africa, and other international news network. 120 staff members and 200 volunteers from the Macao 2nd Asian Indoor Games Organising Committee participation has ensured the smooth operation of the match. These operation areas ranging from accommodation, transportation, hospitality, catering, crowd management, information technology, security measures and media services are tested in the match in preparations for the 2nd Asian Indoor Games in October.